Victoria’s first cemetery at the corner of Johnson and Douglas Sts was used from the beginnings of Fort Victoria in 1843 until the late 1850s. However, this proved to be anything but a quiet resting place as pigs were in the habit of rooting around the graves and unearthing coffins. The 1858 gold rush with its influx of new residents led to the laying of drainage pipes along Johnson; this meant the closure of the little cemetery, which was, in any case, already full. In 1855 the Roman Catholic bishop of Vancouver Island, Modeste Demers, wrote in his diary about a burial he conducted in the “nouveau cimitiere” on February 20 for Adelaide Morrell, wife of Hudson’s Bay employee Leon Morrell. Adelaide died in the log cabin that was later the first home of the Sisters of St Ann (637 Elliot St, James Bay). Emily Morrell, their daughter, was one of the first pupils in the Sister’s school in that same cabin. The Quadra St site had likely only just been opened at this time since the remains from the old cemetery were not transferred until 1859. The proximity of the “new cemetery” on Quadra St to the first Anglican church (where the Law Courts now stand) led to an assumption that the cemetery belonged to the church. It was in fact, inter-denominational, although the Roman Catholic diocese paid for a fence that marked off a special area for its own use. The Quadra St cemetery was nearing its capacity, with close to 2000 interments, by the time that its replacement, Ross Bay Cemetery, opened in 1873. Thus the “new cemetery” became known as the “Old Burying Ground” with no further burials. The only exception was Dr John S. Helmcken who was laid to rest beside his wife in 1920. The city designated the cemetery as a park in 1931. 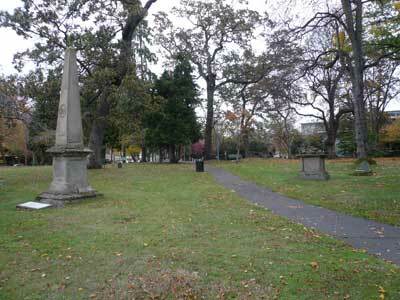 Eventually the vandalized fence was removed and many smaller headstones were moved to the eastern edge. Other than the war memorials, the most imposing monument still standing is dated 1872, for Margaret Pritchard, wife of Thomas Pritchard. Four children of the Cridge family are buried here, with a stone dated 1865, but there is no record of where Adelaide Morrell lies.